Exploring more of Klaipeda, Lithuania, takes us to the Dane River, which separates the Old Town from the more bustling commercial area of New Town. Crossing the Dane River by the Birzos Bridge, it’s impossible not to notice the mast and glowing white sails of “The Meridianas,” a tall sailing ship built in Finland in 1948. 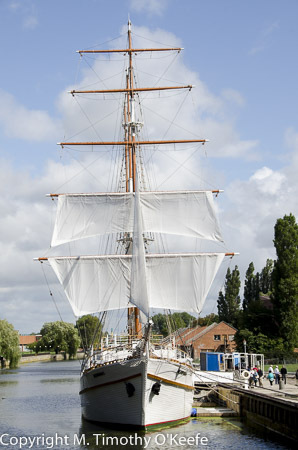 For a time the ship was used by the Klaipeda Navigation School for training. Afterwards, “The Meridianas” turned into a derelict vessel, left to rot at its anchorage. The ship was saved by a prominent lawyer who purchased it for the equivalent of $1. He restored it and turned “The Meridianas” into a floating restaurant. The ship is now one of Klaipeda’s proudest landmarks. Across Birzos Bridge is the new “Arch, Monument to the United Lithuania,” a garden with a large granite formation marking the 80th anniversary of the Klaipeda Region joining with Lithuania. Small red granite columns represent the country’s various regions. One stands apart from the others, representing the status of the Kaliningrad Region of Lithuania, now part of the Russian Federation. 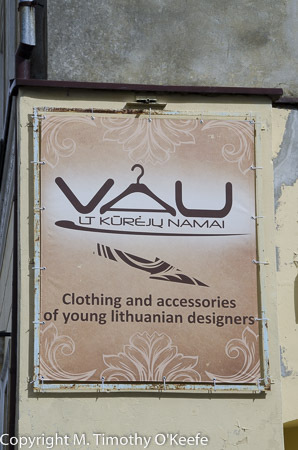 A little more than a block from the bridge is Liepu Street, the 17th century home of city merchants and aristocrats. Many elaborate buildings remain in such architectural styles as neo-Gothic and Jugend, a 19th century art nouveau style also popular in some other Baltic countries. Jugend buildings feature a curb roof, vegetable-type ornaments, gargoyles and other decorative details. With map in hand, we turn right onto Liepu Street, looking for the Clock Museum, a little known place Linda read about in a guidebook. She is interested in the engineering behind how things work, such as our grandfather clock back home. Unfortunately our local tourist board map lacks building numbers, making this search more difficult than necessary. With strip clubs sandwiched between stores and office buildings, Liepu Street may have changed a bit since the 1700’s. We pass one of the city’s most stylish buildings, the Old City Post Office in a red-brick neo-Gothic palace from 1893. It’s now known for the carillon of 48 chromatically tuned bells playing a 30- minute concert here every Sunday. It’s not Sunday and we continue looking for the Clock Museum. The map indicates it’s just beyond the post office. We know we’ve gone too far when we reach Sculpture Park on the edge of a heavily forested area. The park has more than 116 sculptures, some located atop an old cemetery. We retrace Liepu Street but still no Clock Museum. A local who speaks English explains the Clock Museum entrance is up a staircase and the museum sign is visible only across the street from it. Not the easiest place to find and no effort to make it visible. Makes you wonder if they care about visitors. The museum is well worth the trouble. This fascinating and historical showcase of clocks shows the evolution of the essential but little considered necessity that manages our lives. Examples of sun clocks, water clocks, fire clocks and sand clocks are on display. Multi-language information sheets at the entrance of each clock display room contain excellent explanations of their history and how they work. We have more respect for our grandfather clock and whoever came up with the idea of such an impressive precise time that works so well decade after decade. Worth the visit alone is the imaginative and brilliantly colored stained glass window near the tour end. Leaving the museum, we take the Birzos Bridge back across the Dane River to the Old Town and toward the Oceania Marina. 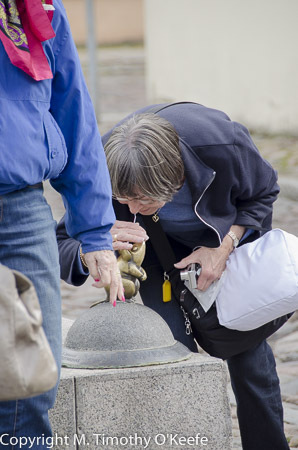 We are determined to find two of Klaipeda’s more famous magical sculptures, a cat and a mouse supposedly able to grant anyone’s strongest wish. They’re among the better known Old Town magical sculptures which include the Old Town Chimney Sweep (he grants luck for a full year to anyone touching his coat button on New Year’s Day) and the Old Town’s Post, a column for residents to drop letters containing wishes, useful suggestions or ideas which actually could be granted. These letters go to prominent local business leaders, the movers and shakers, who have the power to make dreams come true. You have to admire Klaipeda’s quirky attitude about wishful thinking. Our map is worthless for finding any specific location. When we ask about the cat and mouse statues from a man passing on the street, he seems mystified we want to find them. He provides some general directions and off we go, feeling somewhat confused. If these statues are so noteworthy, why can’t we find them? And why did that fellow seem to think we’re crazy to be interested in them? Following his directions, we turn the corner of the next street over where the Old Town Cat with a face of a gentleman should be. Sure enough, in the front yard of an apartment building on Blacksmith Street, struts the elusive magic cat. We both have to laugh, feeling a little foolish. The cat is smaller than our three-year-old grandson. It’s claimed that if you rub the cat’s magic tail, your wishes will come true. This cat’s upright bronze tail has been rubbed shiny. After photographing the cat, and feeling every bit the dumb tourists, we start down the street seeking the magic mouse. No, we don’t rub the cat’s tail. It seems some Klaipeda sculptors like to instill their creations with magical powers to attract attention to them, and legends about their statues’ powers spread over time. That publicity stunt has to include the cat and mouse. The cat can’t be too far from the mouse; that would spoil the game. We stalk back down Blacksmith Street looking for the rodent. Two teenage girls walk the street in front of us, going in the same direction. Two men behind us have an adorable black dog. The taller man gives the dog a hand signal. It starts wagging its tail and barking, running up to the girls. They think this dog is the cutest thing they’ve ever seen! The guys talk to the women who, after a minute or two, continue down the street without the guys. Linda cannot help laughing out loud. She thinks this is one of the best pickup tricks she’s ever seen. Put that way, it’s hard to disagree. But this foolishness is a good icebreaker for starting a wide-ranging conversation about life in Klaipeda, politics, Putin, spies and drones. We sit with the two men on a low wall across from the magic mouse statue. The mouse may be all of 8 inches tall. An Oceania tour group arrives to see the mouse. We watch how they react to the mouse. It’s more fun to be spectators than unsuspecting tourists. Legend has it if you whisper into the mouse’s ear, your wish will come true. That echoes words inscribed on the collar on the bronze cat: “Convert your ideas into words–words will become magic.” We laugh with Budrys and his friend as tour members proceed to whisper wishes into the tiny mouse’s ear. Some women kiss it (not a requirement) perhaps for added good fortune. We enjoy the company of Budrys and his Ukrainian friend but it’s late in the afternoon and we have early dinner reservations with others . We need to start back to the Oceania Marina. Budrys accompanies us. When we reach the town square, he explains why the statue of Ann from Tharau disappeared during War II World. He says Hitler gave a speech from the steps of the Drama Theater. But the statue faces away from the building and Hitler was so outraged at speaking to the back of a sculpture he had it removed. We turn down an invitation from Budrys to buy us a beer. It would be fun but we need to get back to the ship. Klaipeda, however, is famous for is its beer, Svyturys, and Linda talks Tim into stopping at a pub near the ship. Besides enjoying the quick taste of a new brew, it is another chance to see more of the locals while discussing our day in an interesting city we never knew was there.